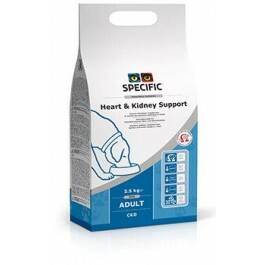 What is SPECIFIC Canine Special Care Heart & Kidney Support dry food? SPECIFIC Heart & Kidney Support is a complete and balanced dry food for dogs with reduced heart, kidney and/or liver function. It is also designed to help prevent the formation of calcium oxalate, urate or cystine stones. The high levels of Omega-3 fish oils support heart rhythm and blood pressure, as well as also helping to support kidney function. The reduced protein content helps to lower the workload on the kidneys. A restricted phosphorus content slows the decline of kidney function and, alongside reduced salt content, helps support normal blood pressure. The added L-carnitine and taurine helps support the heart muscle function. SPECIFIC Heart & Kidney Support helps prevent the formation of calcium oxalate, urate and cystine stones due to the lower protein levels and raised potassium citrate levels. To further aid stone formation prevention, this diet promotes alkaline urine. This diet is packed under nitrogen to preserve the fragile Omega-3 fish oils. This food is suitable for adult dogs with kidney and/or heart disease. Also suitable for dogs suffering from calcium oxalate, urate or cystine stones. What are the benefits of using SPECIFIC Canine Special Care Heart & Kidney Support dry food? 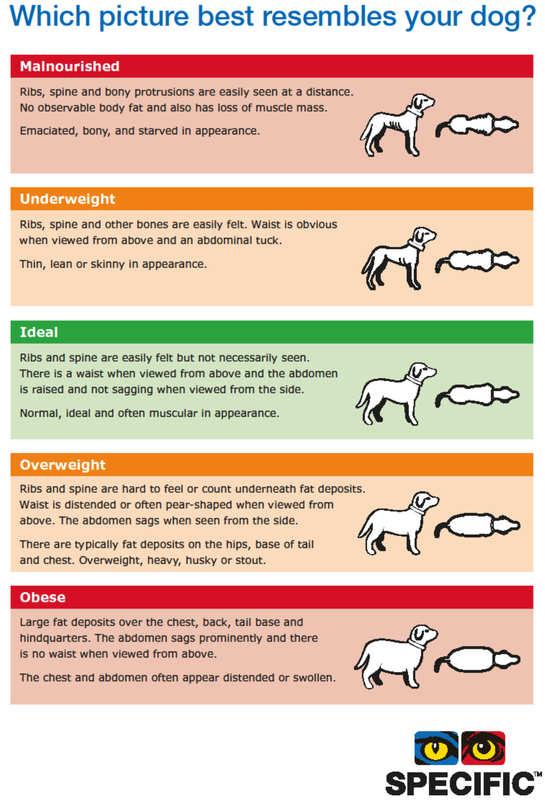 What is in SPECIFIC Canine Special Care Heart & Kidney Support dry food? Maize starch, wheat, rice, fish oil, pork fat, potato protein, eggs, Antarctic krill, minerals (including zeolite), fish meal, hydrolysed poultry protein, whey powder, powdered cellulose, vitamins and trace elements, tripotassium citrate, taurine, L-carnitine, methionine. Crude Protein 13.7g, Crude Fat 16g, Carbohydrate 55.5g, Crude Fibre 1.7g, Calcium 0.38g, Phosphorus 0.26g, Magnesium 0.07g, Sodium 0.13g, Potassium 1.17g, Zinc 28mg, Copper 0.36mg, Taurine 0.24g, L-carnitine 72mg, Omega-3 2.44g, EPA 0.64g, DHA 1.03g, Water 8.5g, Ratio n-3:n-6 1:1. 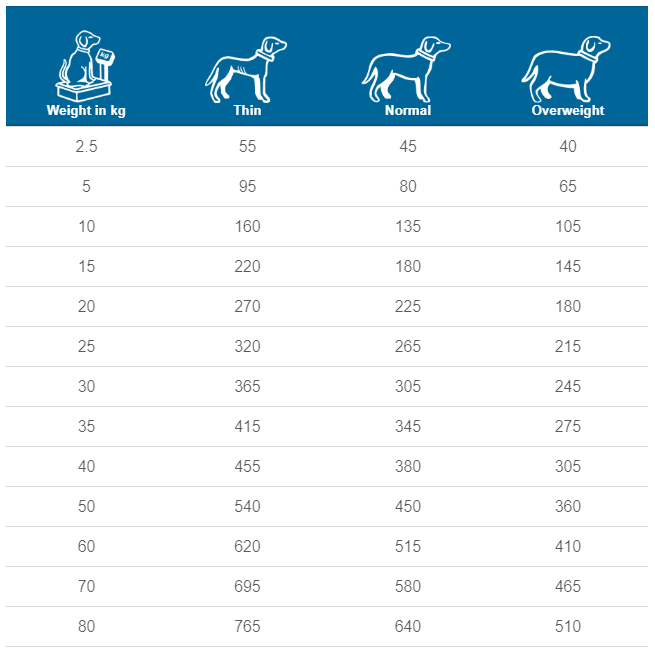 How much SPECIFIC Canine Special Care Heart & Kidney Support dry food should I feed?